Among the sweetest and juiciest of all varieties, fruit from the Comice Pear tree are a favoriet in holiday gift baskets. Their flesh is silky-soft and can be best described as creamy in texture, abundantly full of juice, and very sweet. Widely considered on of the best-flavored Asian varieties, fruit of the Chojuro Pear tree is beautifully golden with a rich, butterscotch flavor when perfectly ripe in mid-September. The tree is also adorned with fragrant blossom in spring. Fruit from the Ishiiwase Asian Pear tree is large, with a greenish-brown, russeted skin and is as crisp as an apple when ripe. Like all Asian Pear varieties, the Ishiiwase is a cross between an apple and a pear. Its juicy, sweet and flavorful fruit is ripe in mid-August. The Hood Pear tree performs best in fertile, well-drained soil, where it can grow to 25 feet in height or more. Its fruit will ripen most evenly once picked and stored, rather than on the tree. Hood Pear fruit can be eaten fresh, canned, juiced, dried or made into jellies and jams. The Hosui Asian Pear tree is one of Japan’s best-selling varieties, with fruit that is the perfect combination of a sweet pear and crispy apple. Its fruit ripens in late August, and is a consistent winner with even the pickiest palates. Monterrey Pears are named after the city Monterrey, Mexico, where they are believed to originate. They became popular in the 1950’s in Texas and are sometimes called “home pears” due to their tendency to be grown in back yards and in home gardens. This large apple-shaped pear is suited for both raw eating and cooked. The Shinko Asian Pear tree is the most blight-resistant of all Asian Pear varieties, and produces a fruit with rich, sweet flavor that is particularly good for cooking and mixing among other fruits and vegetables in a salad. Growing to a hieght of 25 feet or more in fertile, well-drained soil, the Shinseiki Asian Pear tree has strong vertical branches and requires little pruning. Its fruit is tart and sweet, with a subtle fragrance that is pleasing to many a passer-by. This pear has a pineapple aroma and a firm, cream colored flesh with a delicious floral taste. Only about 50 calories per medium pear, these are a good source of Vitamin C and fiber! The Tsu Li Asian Pear is ideal for grilling, roasting, poaching and baking as well as tossing into salads or adding to cheese boards! 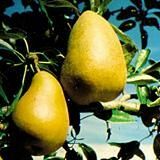 Preferring fertile, well-drained soil and full sun, the 20th Century Pear tree is tolerant to both cold and drought conditions, making it an ideal choice for Southern California. Its fruit is yellow-skinned, crisp and with a taste reminiscent of butterscotch. Producing Shinseiki, Hosui and 20th Century Pear fruit, the 3-in-1 Asian Pear tree is perfect for the enthusiast of the Asian Pear family. This tree is grafted to produce three different varieties of Pears! Sure to keep you happy during the late summer when most pears ripen, this is the perfect tree if you enjoy pears and have space available for only one tree. Pears are delicious when eaten fresh off the tree, tossed into a healthy salad, or baked into a tart or cake! A grafted variety, the 2-in-1 Flordahome/Monterrey Pear tree produces fruit that is ripe in July/August. The Flordahome fruit is sweet and juicy, and the Monterrey fruit is highly resilient, with yellow-green skin that is crisp and sweet.